Eduro Healthcare - Code Janet? CODE JANET! Before the intercom has finished the announcement, people are already pouring out of offices and rooms to line the hallway leading to the front doors at The Suites at Fort Collins. Code Janet is a regular occurrence at the transitional rehab facility, and unlike most codes, is one that everyone eagerly anticipates. Appropriately named after the first patient to discharge from the facility over 18 months ago, Code Janet is an emotional celebration for both patients and team members alike. 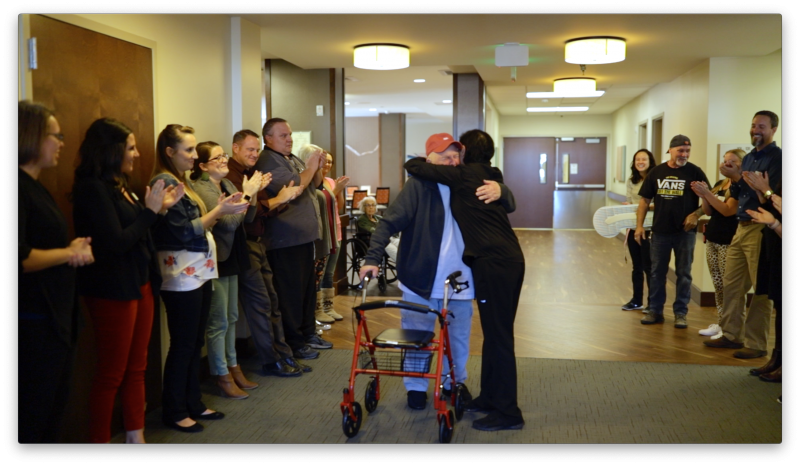 The cheers and applause are often accompanied by tears as the rehabilitated patient walks down the hall, heading home with significant improvements to functional movement and independence levels. Staff from all departments join in on the celebration after witnessing the journey of each patient, each from their unique perspectives. For many patients, Code Janet isn’t a final goodbye to the team, even though they are leaving to move back home. Many patients return to the luxurious facility for outpatient rehab and to enjoy the restaurant dining, which is open to the public. The Suites at Fort Collins is a 70 bed rehabilitation facility featuring 23 independent/assisted living suites. Eduro Healthcare has owned and operated the facility since it was opened in 2017.